DJ Johnson, MFA is a documentary filmmaker, media artist and educator. He serves as Assistant Professor of Cinema Practice in the Media Arts + Practice Division at the USC School of Cinematic Arts. He is recipient of the USC Mellon Mentoring Award for his outstanding teaching and support of undergraduate students. 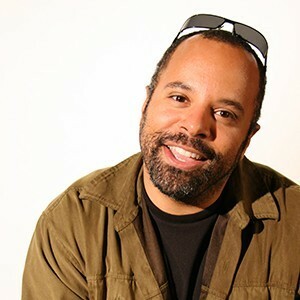 In his prior work as video documentarian for the USC Institute for Multimedia Literacy, DJ developed innovative techniques to document multimedia pedagogy and scholarship. He serves on the Board of Directors of Picture Alternatives, a non-profit organization that uses creative media to promote the social value and effectiveness of alternatives to violence. With expertise in digital storytelling, documentary production and new media, DJ has developed and taught courses for educational programs internationally. DJ is an alumnus of the USC School of Cinematic Arts and Brown University.